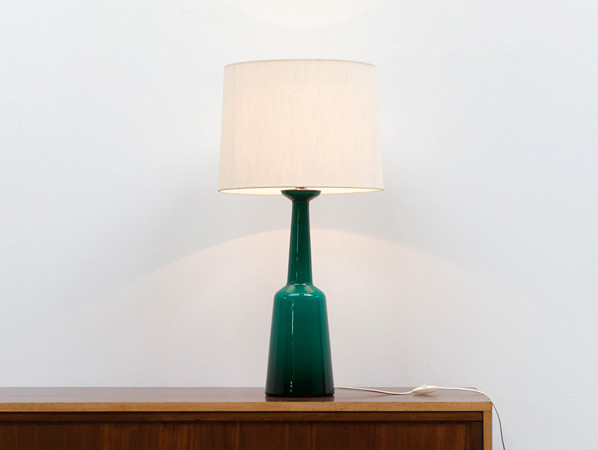 Table lamp, Danish modern. Green colored glass by Kastrup-Holmegaard with classic shade, notice that there is a spot on the shade. Lamp is marked with paper label Kastrup glas, made in Denmark. Lampe de table, moderne. lampe en verre de couleur vert, fabrication Kastrup-Holmegaard avec abat jour classique. L'abat jour a une tache. Pied de lampe marqué avec étiquette en papier Kastrup glas Danemark.